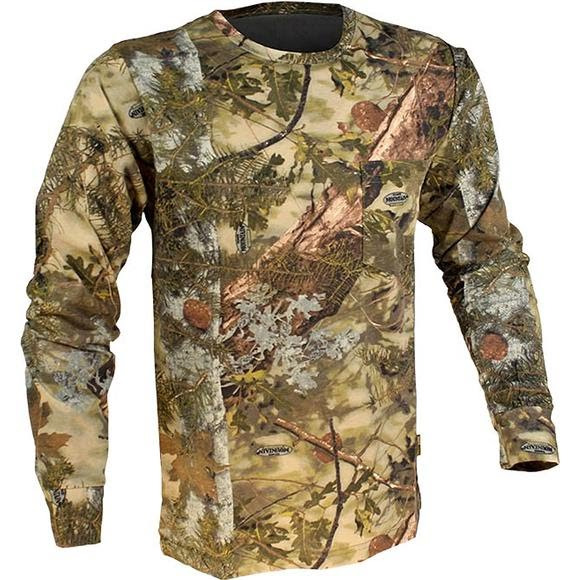 The King's Camo camouflage long-sleeve hunting shirt is made of heavyweight, 80/20 cotton/poly jersey and includes tagless construction for increased comfort. This hunting tee features a chest pocket and rib-knit collar. The King&apos;s Camo camouflage long-sleeve hunting shirt is made of heavyweight, 80/20 cotton/poly jersey and includes tagless construction for increased comfort. This hunting tee features a chest pocket and rib-knit collar. Got 2 camo shirts, different patterns. Nice light shirts. Like the camo patterns. Using them to hunt in Wisconson because I think they blend in better than darker patterns, even if they were not made for here. Most patterns make you look like a blob, I think these lighter patterns will blend in better.